Flashes of Style: Grey Dog Boutique + Flashes of Style GIVEAWAY! Grey Dog Boutique + Flashes of Style GIVEAWAY! Hello friends and Happy Friday! It's an especially special Friday, because it is giveaway time with one of my favorite shops ever... Grey Dog Vintage! I'm sure you have heard me all rave about the dog on my blog throughout the years, as I used to work at the shop during my college years, where the obsession began. More than half of my vintage pieces are from Grey Dog... it's quite an addiction! Anyway, they recently have stocked up on ADORABLE vintage-inspired swimsuits, like this one I wore in Mexico. To kick off the spring season, I have teamed up with my ladies at Grey Dog for a fantastic giveaway! Good luck, ladies and hope you have a wonderful friday! I have been following both accounts for awhile now since I've discovered them on your blog ;) I follow both of them on @thelaurenrachel. If I had to pick, my favorite item currently available would be the ’80s green floral dress. I think it would be so much fun to style for the upcoming festival season! My email is lmalis@comcast.net. I love Grey Dog! I found them a while back through you and had to make a purchase! Even better, I love that they display their clothing on actual girls. It makes vintage online shopping so much easier! I'm following both accounts, and I'm all about that high-waisted tiny black floral bikini. So cute! And also just noticed that incredibly cute giraffe mini dress! I'm so in love with the ’60s aztec blanket coat with fringe! Looks like it would be perfect to wear in the summer after swimming, just hanging on the beach after the sun goes down. Everything is so cute on their website! I love the blue "80s sequin mini dress," it's fabulous! I love that the main model is my height haha takes out the guess work! I've been in love with Grey Dog Vintage for awhile now, such a beautiful store! I have been following both insta accounts and I couldn't just choose one favorite item, I love the Tiffany blue gemstone statement ring and the runched black one piece swimsuit, would be a perfect beach day look!!! My email is jessicasmith828@yahoo.com very excited for the giveaway! Bonnie, just tres adorable. I was flipping through your insta pics and La Duree immediately made me think of time I chugged my African Hot Chocolate there once. I love the retro and vintage look in clothong, lingerie and swimsuits! 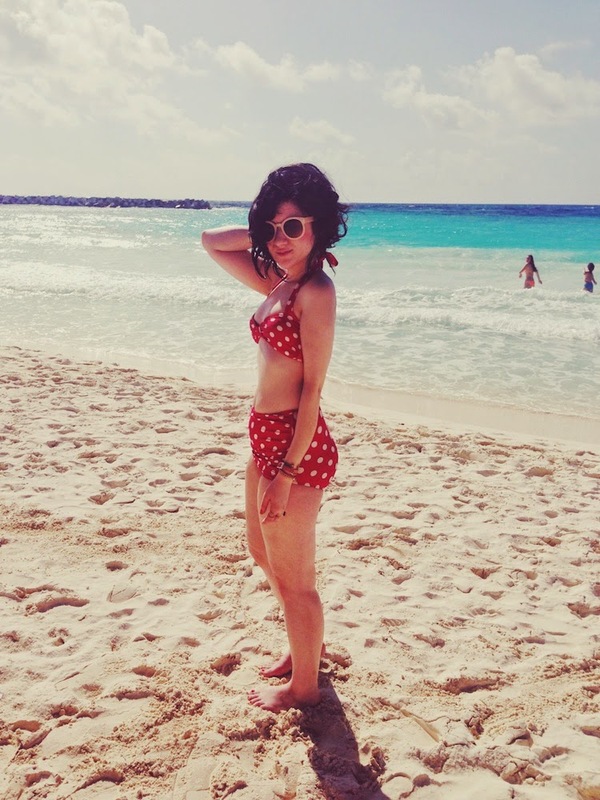 The vintage red polka dotted swim suit from Grey Dog Vintage that you wore in Mexico looks beautiful! Grey Dog Boutique looks like an excellent place to shop. Bonnie, that looks so cute on you! I absolutely love Grey Dog! I follow both accounts. My favorite item right now is the '80s reversible pink lace floral mini dress! I love that it's reversible and it looks amazing worn in either way. Thanks for the contest! I've seen your outfits every now and then from Grey Dog's instagram and from scrolling through this blog, and you definitely know vintage style.! My name's Calia Minassian, I am following both accounts, my email is calia25.cm@gmail.com and I really love the high waisted black floral bikini on their site! So adorable. Thanks for the opportunity, Bonnie! I love Grey Dog. you look so glamorous! i love that suit! I love when you share where you shop! I'm in love with vintage pieces. The 80's navy mini with lace collar and sleeve detail! Is all me! Thanks for sharing! I follow both Instagram accounts. I found the one of them through yours and am so glad I did! One of my favorite items is the 80s black silky blouse because it can go with absolutely anything. Another favorite is the vintage red pearl snap because I'm obsessed with plaid. My email address is yupp_itscrystal@yahoo.com It's lame, I know. Email is hillarycrusan@gmail.com. I followed both @shopgreydogdotcom and @greydogboutique on @hillarycru and I'm loving the '60s black mini with lace detail on the Grey Dog website! Thanks for sharing! Ohhhh my goodness. I've been hoping to win a Grey Dog giveaway for so long and this one seems like the best. one. ever. Of course, I'm following both grey dog accounts! My favorite item they've got on their site right now is the 80s floral+lace mini (and the swimsuits obviously. I'm dying over them). sooo in the love with the wrangler's 70s denim jacket. My favorite look is the one you posted! I would love to get my hands on the high waisted red polka dot bikini! I follow both accounts on Instagram. I love that store! I'm really digging the mumu mini. My email is smelchor@uark.edu. Thanks for the giveaway! Such a great shop! I love all the swimsuits and am in love with the 90s giraffe mini dress!!! I'm following both accounts and my email is vronka1230@gmail.com. I absolutely love the red polka dot swimsuits (1 and 2 piece!) and also the 70's blue ruffle mini with lace and squiggle piping detail. So adorable! Hi! I'm following both Instagram accounts, and my email is pomeroy.ke@gmail.com. My favorite Grey Dog item is the black and white high waisted polka dot bikini, but I also love the high waisted black and white floral skirt! My email is mbennett13@ymail.com, and I'm following both accounts! Right now on my wishlist is the 90's giraffe mini dress, the 80's paisley jumper, and the high-waisted white floral bikini. I wish I had the money to buy everything! Following both accounts - @adarst213, andreaunke@yahoo.com, I love the ’50s pink branch print babydoll mini dress! Following both accounts @paintthegownred. My email is jamie@paintthegownred.com and my fave swimsuit is the high waisted red polka dot bikini! Thanks for hosting such a lovely giveaway! I follow both accounts and this is my favorite item:) my favorite item is the 80s paisley mini dress with statement collar. Oh my goodness is it precious!!! I simply everything really. First off, you have the cutest style and that polka dot bikini is amazing! I have been following you and Christina for years. I am following both instagram accounts. I love everything! - But if i have to choose one thing, it is the vintage seashell choker necklace. Hi! I follow both accounts because their stuff is so great! Those ladies (and you) are so stylish. This is the perfect giveaway because I have been eyeing their cute swimsuits. My email is meredithggordon12@gmail.com. I follow both accounts! I've been following @greydogboutique for awhile, but I only heard about the other account from reading your blog today! I love the styles so much, and wish I was brave enough to try them. My favorite vintage piece currently on the website is all of their sunglasses, but especially the Oversize Tortise Deadstock Sunnies and also the 80's Dandelion blouse with sleeve detail, I love all things yellow. My email is edenpurple@icloud.com and my Instagram is @edenpurple_. I love the vintage high-waisted leather shorts. I followed both @shopgreydogdotcom and @greydogboutique. Their shop is so cute! My favorite piece is the high waisted tiny black floral bikini. Ah! Thanks for hosting this giveaway, Bonnie. I am glad to find the store. I can't say I have an absolute FAVORITE item from Grey Dog because all of their items are absolutely lovely and just oh-so-wonderful, but if I had to pick something- I'd pick the 70's striped maxi skirt with floral designed stripes down the sides. What a beaut! terima kasih, informasinya sangat bermanfaat. Spent a while looking around-my favorite item is the indian oversized statement ring in silver and marbled green. Just gorgeous! Thanks for the lovely giveaway Bonnie! I am following both accounts with @hamptont90. Grey Dog is so deliciously dangerous of an addiction. I am loving the high waisted tiny black floral and large black floral suit! I'm following @greydogboutique and my favorite thing is honestly the red polka dot bikini or the one piece one! sering-sering mas kasih artikel untuk kebaikan situsnya juga.. I absolutely love that red polka dot bikini...super cute!! I also love the 80s navy mini with lace collar and sleeve detail dress. So feminine! I followed both accounts and my email is olivercn4@gmail.com :) Thanks! Also the 80's purple floral plunge tunic is SO fierce. I Love the high waisted large black floral bikini! Hey! I'm following both accounts on instagram. My instagram account is @mabeljimenez and my email address is mabel.jimenezp@gmail.com. It was hard to pick one favorite vintage item on Grey Dog Boutique online. Right now, I definitely go for the High Waisted Red Polka Dot Bikini (http://shopgreydog.com/shop/intimates-and-swim/high-waisted-red-polka-dot-bikini/), I was actually looking for one, but hadn't found one so perfect as this one. I follow both accounts on instagram under the name @mbrleigh, and I definitely love the High Waisted Red Polka Dot Bikini along with the cream floral one piece swimsuit! That swim suit looks so perfect on you! I'm following both accounts through the Instagram name @stylishsilhouettes, and my email is smith_desirae22@yahoo.com. I have to say, the 60's bright pink floral ascot shift has to be my favorite item! I'm super excited about this giveaway! I follow both greydogboutique and shopgreydogdotcom and have loved Grey Dog for quite some time. my favorite item online is the '80s tailored black floral mini. my email is catberg13@hotmail.com. I'm a huge fan of your blog and Instagram; it's my favorite! thanks so much for the opportunity! I follow both accounts under the name @abbra_christine and my email is abbra.pyle@yahoo.com. My favorites are the 70s embroidered top and the 80s high-waisted burgundy skirt. If I had the money they would both be mine! That skirt is exactly what I have been looking for for months. I am following both of their accounts! I love the shop and look into it every time you post something from there! The clothes are to die for and I would love to have them all in my closet. I'm currently obsessed with the bathingsuit you wore on your trip! The red polka dots is the most perfect thing I have ever seen and I would just love to wear it everyday in the summer. Thanks so much for the giveaway opportunity, you're so lovey! <3 my email is kseigel1@gmail.com. I've been following both accounts for a while now because their posts constantly inspire me! I'm in love with the 60s apricot shift dress. It seems perfect for spring here in the south! Thank you so much for the giveaway!!! You give a girl hope! oh my goodness! I almost missed this! eep! I followed both & my favorite piece from the shop right now is the high-waisted tiny black floral bikini! I follow both Grey Dog accounts! My IG name is jabrown222 and my email is jessieb222@gmail.com. My favorite items are those adorable floral high waisted swimsuits. They are so gorgeous! This is such an amazing giveaway! I have been eyeing one of those adorable swim suits for a while now! I follow gray dog boutique, i get so inspired by their posts! It was very difficult to pick a favorite, but i'm in love with the 60s bright pink floral ascot shift. it would be great for the upcoming southern summer! my e-mail is LuciWhitaker@icloud.com. Thank you for the giveaway and for being one of my fashion icons!! I followed both and I'm so grateful I had! I'm so in love with everything (-: thank you! my fav would be the 80's black n white dress! I follow both accounts! My email address is rfirkser(at)smith.edu. The high waist tiny black floral bikini is my favorite! Thanks for a lovely giveaway! The suit is absolutely amazing! I love vintage cuts on swimsuits they're so cute! Thank you so much for hosting this giveaway. My favorite items are the polka-doted one piece swimsuits! So adorable! Absolutely obsessed with everything!!! I would have to say though, that the High-waisted tiny bikini in Black Floral is my favorite so far and may just have to get it before it's gone! Thank you for this opportunity!! i know i was following grey dog at one point, but i was happy to find their account again! i followed both as their clothes are so fab! thank you so much for this opportunity to receive a vintage bathing suit, i've been on the hunt for one! my favorite item would have to be their 60's mod tunic, it's great for y body type and all around a really cool print. My email is amanthadikin@sbcglobal.net and i'd really appreciate if i won! Thanks Bonnie! Cool contest! Following both insta accounts and digging this http://shopgreydog.com/shop/intimates-and-swim/high-waisted-red-polka-dot-bikini/ and that http://shopgreydog.com/shop/intimates-and-swim/ruched-black-one-piece-swimsuit/ - oo oo these are lovelies! I am loving those swimsuits! My favorite Item is the highwaisted black floral swimsuit. I followed both accounts because they sell some reaally great pieces. My email address is mar.trevino97@gmail.com & thanks for this amazing oportunity. Love you! Thanks for introducing this adorable store! I'm now following both insta accounts. My favorite item is the 80s taupe polka dot mini! My email is once again harrypocket@gmail.com! Thanks and love you both! I'm following both accounts and absolutely in love with their clothes. My favorite item would either be the '80s purple floral plunge tunic, because it'd be perfect to wear for spring/summer and I'm already imagining different ways to style it. Or the '90s giraffe mini because it's adorable! I follow both accounts! I didn't know about this boutique until I saw you posting about it on your Instagram. Very cute, unique clothing. My favorite item is the retro bathing with high waist, it comes in so many cute prints. If I don't win I will most likely buy one lol but I would love to win! Why have I not heard of this site!! All the swimsuits are so dreamy! I am following both accounts (eviebilik)! My email is gbilikiewicz@hotmail.com. My favorite item on the site is http://shopgreydog.com/shop/dresses/70s-teal-floral-sheath-with-shoulder-detail/. I've never won anything before! I am following BOTH accounts:) I love absolutely everything in their shop, but my favorite current item is the 80s floral mini with the lace collar and bow. It's just so dainty and feminine. Thank you so much for hosting this giveaway, I think it's so great! Recently, I've been following both accounts of greydogboutique and I've been very much in love! One of my favorite pieces is of the 60's pink mini with silver dots. My Instagram is @lindaitzeld and my email is lindaitzeld@gmail.com. 2) Favorite item is the lovely ’70s terracotta pleats, it will be perfect for my trip to Paris! I follow both instagrams! I love Grey Dog's bathing suits right now. Such a cute, vintage look! Following both insta accounts. My email is haleydavis18@Yahoo.com. I love the high waisted floral bathing suits!! Hi Bonnie! My name is Cara and as a big fan of vintage wear I'd like to thank you for recommending Grey Dog. My favorite piece out of all the lovely selections was the giraffe mini. I followed both instagrams through my account @cairestin and my email is carestindiluvio@massart.edu. Thanks! makasih Situs Anda selalu memberikan informasi yang update dan sangat bermanfaat sekali .. So excited for this giveaway! I've followed both accounts, my email address if latte59@gmail.com,and my favorite item is the ’80s high-waisted brown pleated skirt.